We really want to give Shia Muslims from around the world the opportunity to take control of their search for a soulmate in a discreet, honest, professional and comfortable way. We believe the online channel should be as normal as the other very valuable ways such as family introductions, community networks and matchmakers. In fact we passionately believe you should involve your family in your search for a soulmate and use SimplyShia in parallel with other approaches. SimplyShia offers an excellent opportunity to communicate with people around the world in order to find that one person who will help them complete their faith. You can communicate on this site by sending salaams, some funny icebreakers and online messaging. You can use an anonymous username until you want to exchange personal details, keeping you safe. Please follow our Code of Conduct. Over the coming months and years we are planning to incorporate some exciting and innovative new features. If you want to get involved with SimplyShia or have any suggestions or ideas, drop us a message. 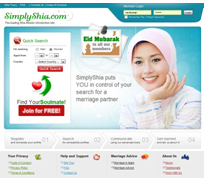 If you get married after meeting someone on SimplyShia, make sure you let us know. We may even give you a wedding present worth £500! We wish you every success in your search insha'allah. SimplyShia just launched for select members to test our service. Welcome, welcome, welcome!